Washougal Motocross Park – Washougal, WA. All riders are required to check in before practice starts on Sept. 2nd, Saturday morning. Riders will receive their practice tickets and weekend schedules. Riders will not practice if they do not check in. No exceptions. Rider check-in will be open the following times. A team can be sponsored by anyone. A sponsor can have multiple teams. Up to 14 classes per team – example: 7 riders x 2 classes. Up to 3 riders in the same class per team. Riders can only ride for 1 race shop/sponsor. A rider can ride on multiple teams within his team sponsor. Rosters must be filled out completely & clearly. Team rider lists will be available online. Riders names / classes / numbers must be correctly filled out. No team roster changes once submitted. Rosters are due by Saturday, August 1st by 9 am. There will be a contact person and a form to fill out for issues and problems regarding the scoring. Please do not disturb the lap checkers and scorers; you will be disqualified if you create any problems. Please make sure you check results when posted. You will have 30 minutes from time results are posted to file a protest. There will be NO EXCEPTIONS. Everyone after 20th place will receive one point. *For the overall team points we will be taking each team’s best 36 moto finishes out of the team’s 42 moto finishes. That means we will be dropping each team’s worst 6 moto finishes. Riders that finished in the top 3 placing in the Beginner or Junior classes at previous Top Gun events can not ride the same class. Rider classification protests must be accompanied with proof of competing in a higher class. ALL PROTESTS WILL BE KEPT CONFIDENTIAL. Only exception: Riders can not be forced to move into the professional class. * For riders just coming for Friday organized practice, you will need to pay the full weekend gate admission to enter the park for practice. 3 moto format: All amateurs and professionals. Race schedule will be posted online. Practice will be on Saturday only for all classes. Race schedule will run continuously each day to a certain time. Every year at the Top Gun Motocross Team Shootout we hold a “benefit raffle”. All proceeds from the raffle will be donated to a local rider in need of financial assistance for medical debt. Check back for a list of items we are raffling off. 25+ Pro, 30+ Expert – 100% Pro Payback. Trophies will be handed out to the Top 33% in each class. Trophies will be determined on the overall finish of all 3 motos. Winning team will be presented with the prestigious “Top Gun” billet trophy on Monday after racing and scoring conclude. We will announce the winners and present them with their awards. 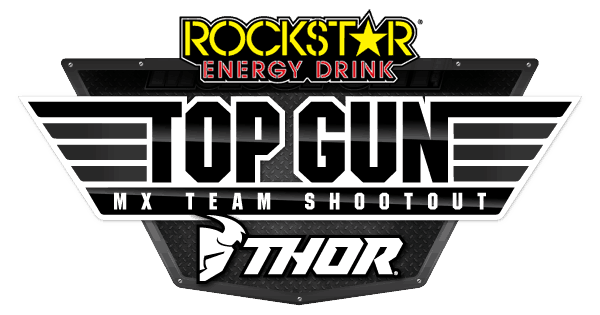 The “Top Gun” trophy will remain with the winning team until the next years “Top Gun Team Shootout”.